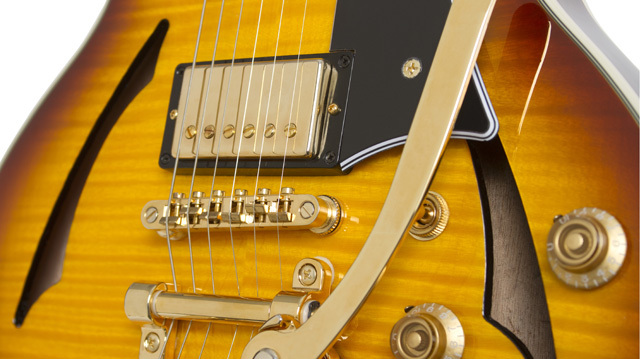 Featuring Gibson 57 Classic™ humbuckers, Bigsby® B70 Vibrato, and hard case. 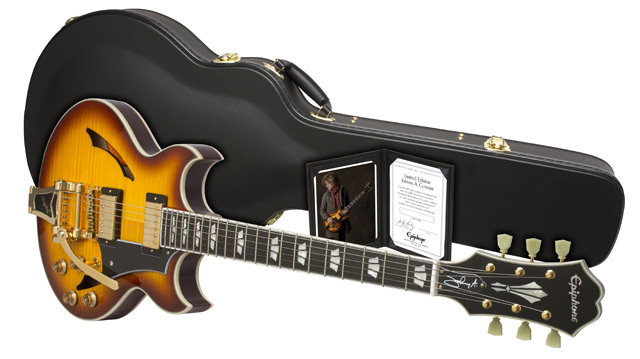 Epiphone presents the Ltd. Ed. Johnny A. Custom Outfit, the premier signature hollowbody archtop by renowned guitarist, singer, and bandleader Johnny A. Featuring Johnny A.’s custom double-cutaway design in a Sunset Glow gloss finish, plus Gibson ’57 Classic humbuckers, Ebony Fretboard, Bigsby® B70 Vibrato, and hard case. Fingerboard Inlays Mother of Pearl"Johnny A. Custom"
Headstock Inlay Mother of Pearl "Johnny A. Custom"
For over two decades, Johnny A. has cultivated a reputation as one of rock n’ roll’s supreme guitarists and bandleaders. And his custom hollowbody archtop, which features a sharp double cutaway along with its unique sound hole design, has made Johnny A. one of the most easily recognized players working today. Now, Epiphone presents Johnny A.’s first custom signature archtop for the “House of Stathopoulo” in a beautiful Sunset Glow gloss finish. The Ltd. Ed. Johnny A. Custom Outfit features a thin-line style hollowbody design made from Mahogany with a beautiful Flame Maple top finished in Sunset Glow. The Johnny A. Custom is easily recognized by its double cutaway and features modern non-script “f-holes” with a matching black pickguard. The body of the Johnny A. has 5-layer white and black (pure white/black) on the top and 3-play binding on the back. 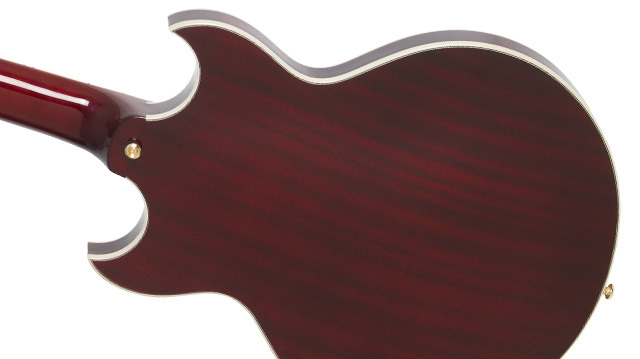 The Mahogany neck has a Custom “C” profile with 3-ply pure white and black binding. The Ebony fretboard includes Johnny’s unique pearloid inlay and has a 12” radius with 22 medium frets and 1.69” nut. 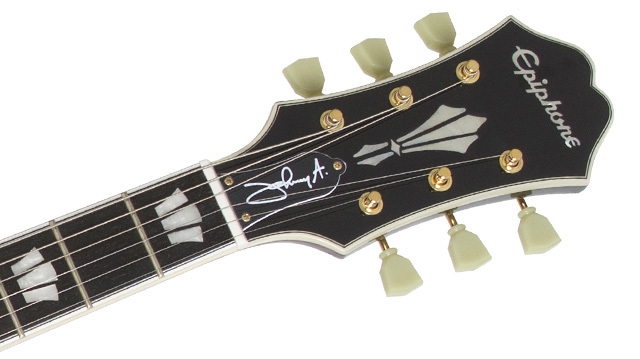 The bound headstock has an Epiphone logo in pearloid along with a custom "Johnny A." in pearloid. The Johnny A. Custom features Epiphone’s legendary rock solid hardware including an ABR-1 Tune-o-matic bridge and a classic Bigsby® B70 Vibrato along with gold nickel hardware, an Epiphone Heavy-Duty 1/4" all-metal jack plate, gold pickup covers, and Epiphone "Deluxe" machine heads with a 18:1 ratio. A hard case is included. The Ltd. Ed. Johnny A. Custom Outfit is powered by Gibson '57 Classic Humbuckers, which are based on Gibson’s legendary hand-wound “Les Paul Standard” humbuckers from the late 50s. Today, those rare pickups are recognized by collectors by the black “Patent Applied For” sticker on the back, applied at the factory. Today’s new Gibson 57TM Classic humbuckers are made with the same Alnico II magnets as the originals (plus a reproduction of the “Patent Applied For” sticker!) and are wax potted to keep down noise and feedback at high-volume. 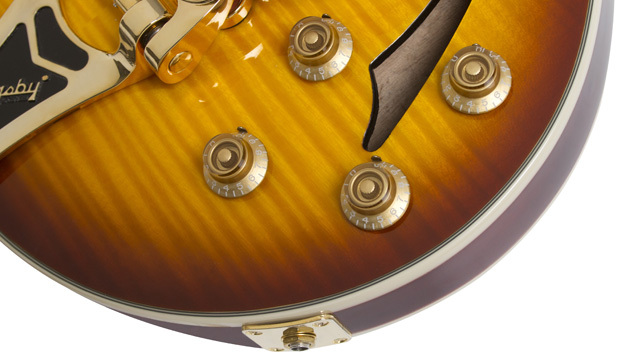 Gibson 57s also include vintage style enamel-coated wire, nickel-plated pole pieces, nickel slugs, maple spacers, and 2-conductor braided wiring for a complete vintage experience without the vintage price tag. Controls for the Johnny A. are standard Volume and Tone pots for each pickup with Gold "top hat" knobs with metal pointers. The Ltd. Ed. Johnny A. Custom Outfit comes with Epiphone’s Limited Lifetime Warranty and Gibson 365/24/7 Custom Service. Available for a limited time only. Visit your nearest Authorized Epiphone Dealer or visit Epiphone.com for details.